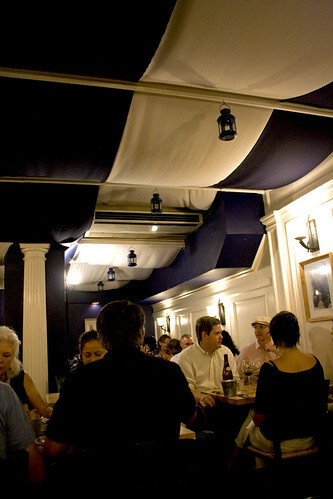 I remember reading from NY Magazine’s review about Kefi and put their name on my lengthy “Must Try” restaurants list. Somehow, that list was forgotten and banished to the dark, hidden corners of my mind. Even hanging out with a friend of mine over the course of the year who has mentioned Kefi nearly ten times, telling me how great this place is. I still haven’t went there. Until several Fridays ago. I invited eight friends (of the group, Jess and Robyn were the only ones with blog/sites). Since it was during the prime dinner hour (we arrived at 7:30) and they don’t take reservations, we had to sit and wait at the front bar area for fifteen to twenty minutes. At least we had time to chat and get to know each other since to some haven’t met each other before. 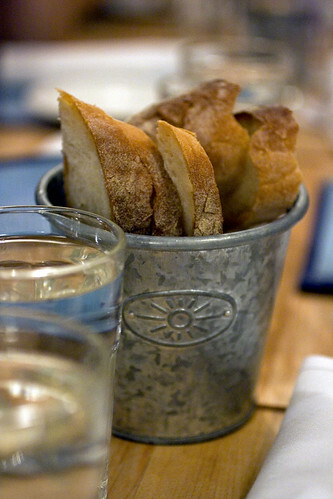 Most of us helped ourselves to a slice of bread since we’re pretty much at the point of starvation. Nothing extraordinary about this baked carb but it helped sustain us for the moment before we actually get the food. We’ve ordered two plates of crispy sweetbreads. 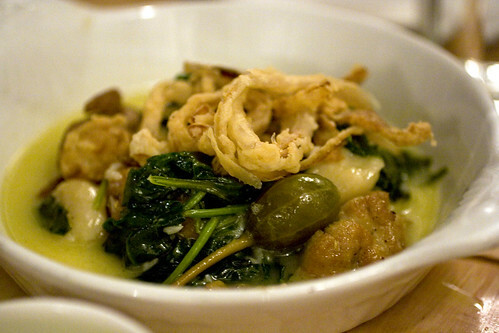 I think by now, you know I love sweetbreads (or any offals). 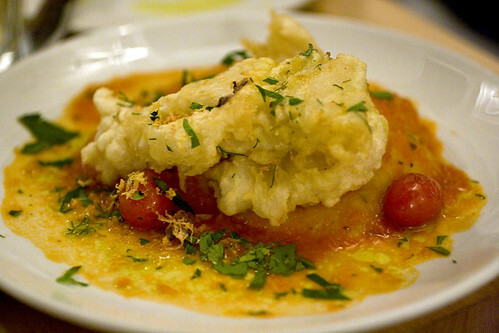 What makes this different from other restaurants is that they deep fried it – which makes it more awesome. They mixed it with some spinach, overgrown capers that were the size of olives, cannellini beans, and another fried substance that I can’t figure out. The drawback was the sweetbreads were getting soggy from sitting in its sauce. It’s still tasty but I like my fried stuff crispy. 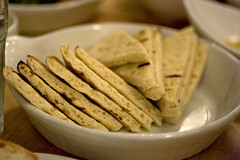 The selection of spreads, which is an assortment of four dips that’s served with warmed pita bread. (You may click on the spread photo that’s above on the right to know which is which.) My favorite of the bunch is the “caviar” or in Greek, taramosalata. I never knew salted fish roe would taste so creamy. Moving onto the grilled octopus, this was pretty damn tender – comparable to what I ate at Babbo. 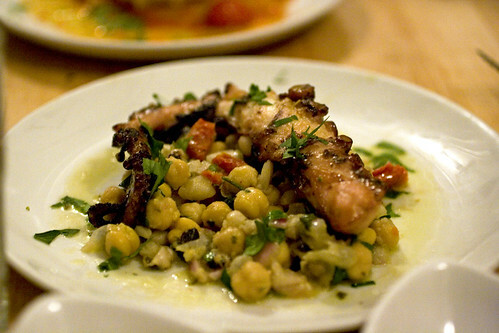 The non-rubbery octopus with the crunchy chickpeas and sweet-tart sun dried tomatoes tasted like a wonderful symphony. I just wish I had more despite the fact we’re sharing one plate of this amongst all of us. I really liked the flat pasta dish. The egg-y pasta, fork-tender rabbit, tangy graviera cheese, and sweet hints from the pearl onions. It’s a bit hearty for a late summer dish but I don’t mind warming up to it during the colder months of winter. 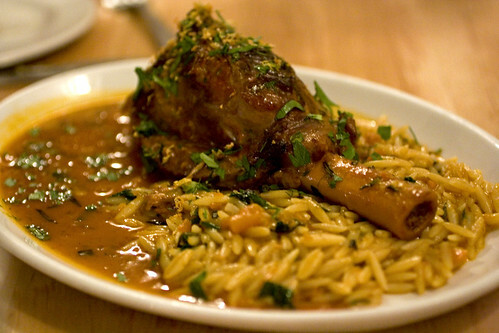 The braised lamb shank with orzo was enormous in terms of size. Thankfully, I had many stomachs people to eat with me. The moist, succulent lamb worked very well with the delicate orzo. But at this point, my stomach wants me to stop eating. But I can’t stop. 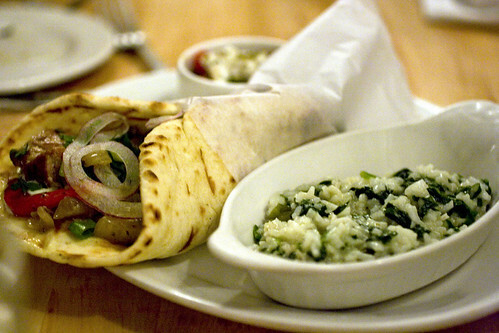 The pork souvlaki is calling my name – a huge warm, grilled pita wrapped with juicy shredded pork, tzatziki, and a medley of onions, bell peppers, and herbs. The problem was figuring out how to tackle this beast to get a share and not make a mess of it. The sides that’s served along with the souvlaki are a creamy rice dish mixed with spinach and dill and a cherry tomato and feta salad. 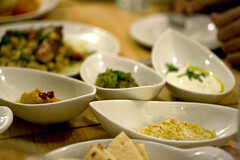 After eating this haute Greek feast, we asked for the check since we’re pretty much at the point of feeling satiated. 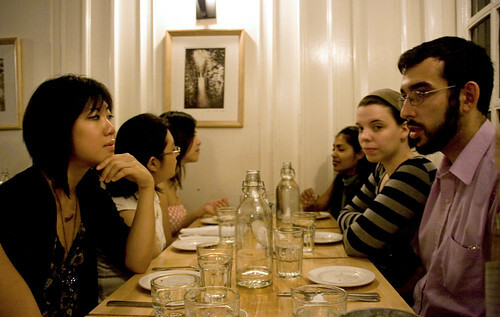 For what we ate, this was an inexpensive dinner – each of us paid about $17. Besides the price of what we spent for this meal, I would come back after they move to their new space several blocks uptown. The food’s excellent, prices are gentle and I miss seeing my friends (especially the ones I haven’t seen in recent months). Il Buco's "Sagra del Maiale"
Yeah! I’m a sweetbread fan too! About 12 years ago, I tried ordering them through my butcher. It took two weeks to get them in. Nowadays, he has them in stock all the time. Progress! That looks like a fantastic feast! I bet Wylie at wd~50 could turn a cod and mashed potato dish into a sandwich. They could probably find a way to deep fry the mashed potato so it has a hard outter shell that would make it stand up to squishing. Back to a lighter note, this sounds absolutely delicious, I love Greek food. Taramasalata actually isn’t the same as tarama though it’s made with tarama, obvs. Taramasalata has bread or potatoes in it (f’reals; when I was in Greece and the owner came over to tell us this, we were boggled) and yogurt as well I believe. So delicious *cries* I’ve been looking for a really good, accessible version. 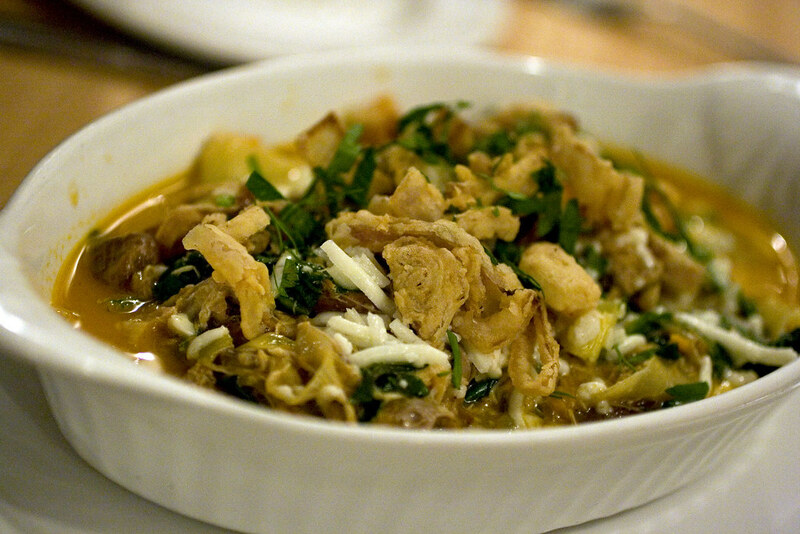 The jarred kind is kind of crap and Turkish Kitchen isn’t like, right on my way home or anything. Ah well. Just supped at Kefi last night and as a Greek I was impressed with the twists on Greek classics and never alienated as the dishes stayed true to Greek cuisine.